Caged Animals is a genre-defying band that embraces its humble beginnings as the solo, home recorded project of one Nick Cacchione. Unlike his other musical endeavours – like the dark indie-psych-rock of the nightmare inspired Soft Black – Caged Animals is a gentler affair. This album melds delicate synths and resonating lyrics to create a fairly unique sound that is part electronica, part dream-pop, and even just a little bit R&B. 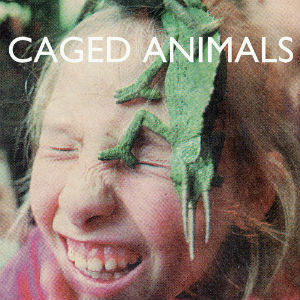 Where Caged Animals’ debut, Eat Their Own, was limited by its solo, homemade nature, the introduction of new band members has In The Land Of Giants showing a fuller, more textured pop-like sound that’s enjoyable to listen to without distracting from the deeply personal nature of the songwriting. As well as proving to be a more developed sound, this album is also a more cheerful collection of songs…although you may not believe it from the lyrics of opening track “Too Much Dark.” The album’s highlight for sure is the bouncy synth-laden Bonnie & Clyde-like love song “Cindy + Me,” the song’s slightly disturbing subject matter brilliantly overlaid by a glitchy electronic beat. According to Cacchione’s own description, In The Land Of Giants was “about making something emotional, direct, and human within the context of computer-made, electronic music.” It definitely checks that box.